It's fair to say that Miniwatt got quite a lot of attention with their miniature valve amplifiers, the Miniwatt, and n4. Their latest product moves away from amplification into the world of computer audio, and is a USB DAC/converter called (logically following on from the n3 amplifier) the n4. Described on the Miniwatt site as a "minimalistic design" it actually appears not so minimal compared to some of its competitors like the hiFace DAC. For a start, the n4 is connected by a USB lead to the host computer. Then it has a built in (push button) digital volume control to control the output, both through the RCA sockets, and the jack socket that we can connect headphones to. Yes, the n4 is also a headphone amplifier, and for good measure, the n4 also operates as a USB converter, allowing the user to connect up a DAC of their choice via the RCA SPDIF output socket. All this is wrapped up in a rather attractive package consisting of an aluminium casing covered in hand-stitched leather. It reminds me a little of those hip flasks that were once popular to carry around whiskey or brandy in the pocket. A lot of attention has gone into the detail of the n4, and it does look very classy. As regards size it is considerably bigger than the hiFace DAC, and is about the same size the iFi iDAC although it is flatter and wider, and slightly shorter. Inside the luxurious looking case the specification is no less impressive. 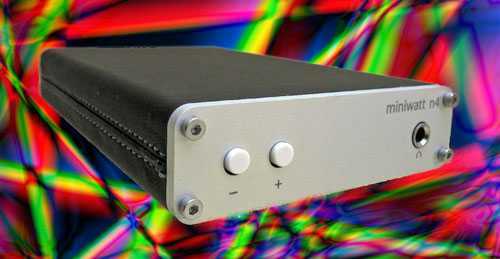 This is a 192kHz/32 bit DAC handling the highest resolution music files that are currently available. 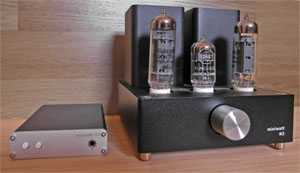 It is an asynchronous DAC with an impressive 123 db of dynamic range. No details are given about the chips used but "audiophile grade components" are apparently used. The n4 requires a driver for Windows operating systems that can be downloaded from the Miniwatt support page together with a comprehensive users manual. For Linux and MAC operating systems, it is simply a matter of plug and play. Having auditioned the amazing iFi iDAC and hiface DAC, my expectations for these USB DACs had grown quite a bit, and I wondered if the n4 would be able to compete, or if it was just a very pretty box of components. I had my Linux computer connected up and so for no other reason, I plugged in the n4 between that computer and a pair of monoblock Gainclones driving my modified Mordaunt Short Pageant II speakers. Having booted into Ubuntu 12.04, I started the QMMP music player, selected a track and clicked on play. The n4 was more like the hiFace DAC in that it sounded good right from the start, good enough to have me go through a number of tracks before going off to leave it to burn in for the rest of the day. The next day I went back for a serious listening session and the first thing that I asked myself was did the n4 compete with the iDAC and hiFace DAC. At first I thought that it was slightly behind them but as time went on I felt that it actually sounded slightly different to them, rather than inferior to them. The n4 has a slightly softer presentation, but not softer in a negative way, perhaps more delicate would be a better description. Once again, the amount of detail being pulled out of the recordings was impressive. The sound stage was large, stretching beyond the width of the speakers, and the wall behind them. The imaging was excellent although in that aspect I would say that the other two DACs were a tad sharper. But it wasn't a big enough difference to notice unless you are actually listening for it, and of course have heard all three DACs. Tonally, the n4 is slightly different to the other two DACs, not warmer but perhaps very slightly richer in tone. As with the other DACs, the bass was impressive, strong and well controlled, and fast too. The top end presented no problems over long listening sessions, and I really could have listened to the n4 all day. I couldn't resist swapping out the Gainclones for the n3 amplifier as I am sure that Miniwatt would have designed/voiced them to work together. And they do sound beautiful working in tandem with the n3's volume control set to maximum, and the volume level controlled from the computer. There wasn't much difference from the Gainclones with every aspect of the music sounding very enjoyable, with the n4/n3 combination sounding just a little more laid back. Looking at the tiny combination of n3 and n4 , it was hard to believe that the 'large' sound coming out of the speakers was being produced by such a small amount of hi-fi! I next swapped the Linux computer for one running W8 and JPlay/Foobar. The installation of the driver for the n4 went without any problem and I was soon playing music. This was actually a newer computer with a faster CPU and more RAM, and a new version of JPlay (v5.1). This new version is a significant step forward in sound quality for JPlay, and using it with the n4 produced slightly more detail that the Ubuntu system did. Other than that it was much the same with the n4 sounding highly impressive, and very enjoyable. While talking about operating systems, I must also report that the n4 worked flawlessly with all the Linux versions that I used it with (Ubuntu, Lubuntu and Audiophile Linux). I mention this because for some bizarre reason, the iDAC and hiFace DAC would only work with a Linux system if it had been freshly installed and as soon as that computer was rebooted, I could get no sound out of them. At the time of writing this I have been unable to solve that issue with the iFi iDAC but M2Tech have provided a solution for the hiFace DAC. Keep this in mind if you prefer to use one of the Linux operating systems. Connecting a Havana DAC (and my highly modified Scott Nixon DacKit) to the SPDIF output of the n4 produced results almost indistinguishable from the hiFace 2 USB converter, in other words, it also did a very good job as a converter. 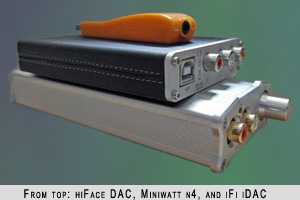 The Miniwatt n4 costs significantly more than the hiFace DAC and roughly the same as the iFi iDAC. The hiFace DAC is the most basic of the trio having clearly been designed to offer the best sound quality per pound/euro/dollar (and does so). The iDAC and n4 have included more features like volume control, phono sockets, and more sophisticated enclosures. If I was forced to choose between the iDAC and n4 purely on sound quality I would (very) narrowly choose the iDAC. But I much prefer the finish of the n4, and the provision of an SPDIF output, allowing me to add an external DAC is most welcome too (perhaps less so if you don't have external DACs that you want to try with a computer audio source). Paired with its sibling, the n3 valve amplifier, the combination makes beautiful music, takes up hardly any space, and looks gorgeous too. Like the n3 amplifier (for which it makes an excellent partner), it's hard not to fall in love with the n4, and for that reason I give it a strong recommendation.